Packaged in a convenient, rack-ready, plug-and-play form factor, Maevex 6120 delivers simultaneous dual 4K input capture, stream, and record, with options to stream and record even more channels in different configurations. All this on a standard 1 Gigabit Ethernet network. Maevex 6120 can feed cloud-based servers to reach internet viewers, push many streams on-premises over the LAN for local audiences, and record to local or network storage for later editing and viewing—all simultaneously. The appliance supports all the popular transport protocols for IP video streams, including Secure Reliable Transport (SRT) that is optimized to deliver high-quality, low-latency streaming over the internet. Coupled with the Maevex PowerStream Plus software—the market’s most advanced AV-over-IP software tool—the Maevex 6120 appliance delivers reliable industry-leading technology for flexible management of local or remote data, ensuring complete reach and control over the entire Maevex network. For rapid customization, the PowerStream Plus API for Windows® and Linux® and the Maevex 6100 Series REST API are available for integrators and developers looking to create personalized Maevex control applications. These APIs can be used to easily include Maevex functionality into existing or even third-party applications. Drive dual 4K/UHD capture and encoding—with the option to stream and record even more channels in different configurations—simultaneously. Deliver best-in-breed H.264 encoding support for up to 4K/UHD with configurable multi chroma sub-sampling options for 4:4:4, 4:2:2, 4:2:0, and 4:0:0. Use PowerStream Plus software to configure multi-protocol streaming, multi-bitrate streaming, multiple source capture, multiple Picture-in Picture (PiP) and quadrant composite options, and more. Support simultaneous SRT, RTSP, RTP, RTMP, and MPEG2.TS streaming and MP4 recording—all without sacrificing quality. Employ simultaneous video streaming, processing, and recording on all channels, while customizing settings independently on each channel. Carry out multiple encoder tasks (stream and record) in multiple settings, without compromising quality, by using a single appliance. Reach on premises and internet viewers, and record to local or network storage for later editing and viewing, concurrently. Transmit live and/or recorded content to multiple video-on-demand platforms. Simplify workflow with auto discovery of any Maevex unit on the subnet, and easily add units outside the subnet. Configure settings and parameters on each Maevex unit from a central application accessible from multiple locations on the network. Monitor and manage the entire Maevex installation of devices, and streams through the intuitive PowerStream Plus software and/or APIs. 1 Requires specific source timings; contact Matrox for more details. 2 Each encoding capability is independent of the others listed, and excludes any additional processing such as compositing, scaling, etc. Content can affect results. 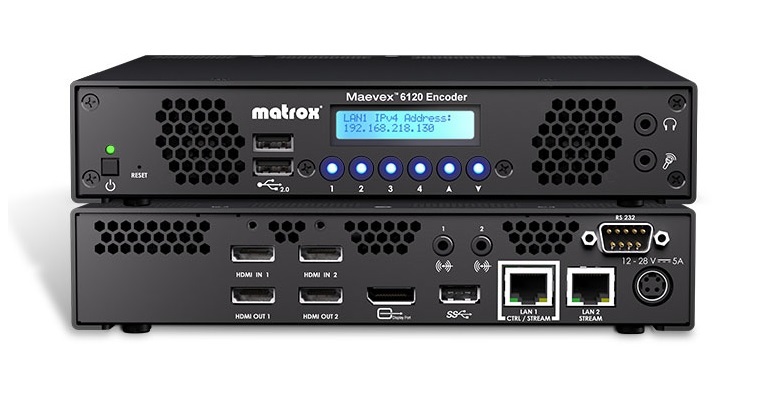 Contact Matrox for more details and encoding capability support. 3 Maximum operational bitrate per stream is dependent on number of streams and features enabled. 4 Contact Matrox for more details.